We’d love your help. Let us know what’s wrong with this preview of Faery Tale by Signe Pike. To ask other readers questions about Faery Tale, please sign up. What Should I Read in 2011? Well now. This book came to me at exactly the time that I needed to read it ! What a fabulous, magical ride ! What is so amazing about it, is that it is all true. I truly could not put it down from start to end and it has changed my perspective. Do I believe in faeries now ? Perhaps. But more importantly, I agree with the author "But now I knew there were many kinds of magic in life." Take some time and get back to that magical place inside, with this read. I didn't know what to expect when I went into this. All I knew is that I loved Fairy Tales, and I loved the UK. This memoir involves both. What Signe Pike manages to do is deftly intertwine her own personal story and loss into her journey through these inspiring lands. And it didn't seem too preachy. I flew through the pages, and even felt myself getting a little choked up every once and again. More than anything, though, this made me want to travel back to Skye and Oxford and London and Edinburg I didn't know what to expect when I went into this. All I knew is that I loved Fairy Tales, and I loved the UK. This memoir involves both. What Signe Pike manages to do is deftly intertwine her own personal story and loss into her journey through these inspiring lands. And it didn't seem too preachy. I flew through the pages, and even felt myself getting a little choked up every once and again. More than anything, though, this made me want to travel back to Skye and Oxford and London and Edinburgh. Following the death of her father, with whom her relationship had been tempestuous, Signe Pike set off on a journey to magical sites in Mexico, England, Scotland, Ireland and the Isle of Man. Her voyage of discovery proved to be as much an exorcism of inner demons as an open-minded immersion in the magic of the faery folk. Each country Pike visited has its own folklore involving 'little people'. This begs the question: how is it that - many thousands of years ago - tribes without common roots al Following the death of her father, with whom her relationship had been tempestuous, Signe Pike set off on a journey to magical sites in Mexico, England, Scotland, Ireland and the Isle of Man. Her voyage of discovery proved to be as much an exorcism of inner demons as an open-minded immersion in the magic of the faery folk. Each country Pike visited has its own folklore involving 'little people'. This begs the question: how is it that - many thousands of years ago - tribes without common roots all told stories of 'hidden people' who were conduits between Earth's natural forces and the physical beings on the planet? Throughout her journey, Signe Pike opened herself to these mystical creatures...with fascinating results. Belief influences perception: people who believe in God will see the Divine in everything; atheists will attempt to scientifically explain even the most inexplicable phenomena; Signe Pike, however, was so passionate about reviving her childhood belief in all things mystical (while incorporating newly learned folklore from around the globe) that she saw magic everywhere. Her open-mindedness makes the storytelling refreshing, although I found myself frowning when she attempted to attribute mundane real-world events to faery intervention. For example, when faced with an oncoming vehicle heading straight for her car, she veered out of its path and smashed into a wall. Pike attributed this crash to faery mischief, but there wasn't a glimmer of evidence that this was the case. Such was her faery-finding fervour that she didn't think it possible the human who drove recklessly up the middle of the road was to blame. This is a minor niggle, though. More often than not, Pike's sojourns into wild places resulted in experiences rich in symbolism, serendipity and faery magic. I was interested to read that on the Isle of Man, where faery lore is inextricably weaved into the culture, locals don't cross the Faery Bridge without acknowledging the faeries' existence, a practice motivated by fear of faery retribution; even foreign bikers who participate in the Isle of Man's annual TT races carry out this ritual, unwilling to offend the faery folk lest they meet a grisly end when their motorcycle careers off the road at high speed. On Dartmoor stands a stone circle where indigenous wild ponies perform a mysterious ritual: one by one they enter the circle, pause at the central monolith, gaze at it with reverence, then leave. In contrast, trained horses refuse to enter the circle, terrified by its proximity. It seems that domesticated horses - which have had their animal natures 'broken' by humans - feel that they're not welcome in the ancient stone circle, while animals that have retained their wild spirit are kin to the faeries, and able to commune with associated energies. Pike meets several artists who have attuned themselves to the faery frequency. Brian Froud, creator of The Dark Crystal, is one such man. Froud doesn't consider himself particularly creative; as a vessel for faery consciousness, he turns visions into puppets. Signe Pike's descriptions of sacred places are immaculate in their sensual detail, as are the expressions of her expanding emotions and mindset. The book will probably prove to be a love-it-or-hate-it proposition. Readers with open minds and a love of folklore will consider it manna from Heaven (or, more appropriately, Tìr na nÒg). Those whose minds are closed to the possibility of a wider reality will likely fail to appreciate the book's beauty and profundity. Just as Signe Pike was forever altered by her experiences, Faery Tale will have a comparable effect on many of its readers. It put a smile on my face throughout. Hail to the little people! Faery Tale's title is misleadingly appealing. The title itself is far more interesting than the actual content within its covers. The title might lead you to believe this is the memoir of a woman seeking mystery, looking within herself and her world for more than meets the eye and finding beauty in the everyday moments of life. Instead, you'll get the story of a girl who heads to the British Isles ostensibly to prove that faeries are real, but in reality wants to avoid dealing with the recent de Faery Tale's title is misleadingly appealing. The title itself is far more interesting than the actual content within its covers. The title might lead you to believe this is the memoir of a woman seeking mystery, looking within herself and her world for more than meets the eye and finding beauty in the everyday moments of life. Instead, you'll get the story of a girl who heads to the British Isles ostensibly to prove that faeries are real, but in reality wants to avoid dealing with the recent death of her father. Worst of all? This journey isn't magical, isn't well-written and doesn't draw you in as the reader. I was not without compassion for Signe Pike. Her memories of her recently deceased father run the gamut from terrifying to heartwarming. My own memories are more the former than the latter. At least Signe had a father who was present and loving for part of her childhood. Yet she rightly mourns his death and longs to grieve and move on. Sadly she doesn't so much deal with her grief as flee it in her search for faeries. Signe experiences several inexplicable things on her travels. I don't doubt that they happened - I only wish she'd had eyes to see that the answers might lie within faith rather than with faeries. Pike was never able to move past her skepticism. She simply set out with one mission in mind and held firmly to that, rather than being open to true mystery. I'm sure any criticism by ardent devotees of this book will be met with accusations of having lost the innocence of childhood or the sense of magic in nature or some other New Age shortcoming. And that may well be true. I don't believe in fairies, and I'm not going to start clapping my hands now either. And I have to admit that, yes, I would look askance at any grown-up adult claiming to believe in fairies, and particularly one who gave up her job, left her fiancee in New York and spent two and I'm sure any criticism by ardent devotees of this book will be met with accusations of having lost the innocence of childhood or the sense of magic in nature or some other New Age shortcoming. And that may well be true. I don't believe in fairies, and I'm not going to start clapping my hands now either. And I have to admit that, yes, I would look askance at any grown-up adult claiming to believe in fairies, and particularly one who gave up her job, left her fiancee in New York and spent two and a half months travelling around the British Isles looking for them. In addition, I'm not sure this book is really aimed at Brits - it's full of an almost typical American fascination with the history and 'quaintness' of Britain, a conviction that thatched cottages and drystone walls and folklore and hidden glens must automatically equal magic. I didn't really recognise this Britain, but perhaps I need to get in touch with my inner child in order to do so. I'm not against the idea of recapturing the magic of youth, of attempting to rediscover the mystery and myth of the world we live in. I have no problem with people trying to rediscover their inner child, or shedding a lot of the scepticism and cynicism of adult life. Those are admirable goals, to be sure - but this book didn't do it for me. I just found it breathlessly credulous. I loved this book to the point where I am definitely going to give it to friends/family, but I will buy them their own copy because I don’t want to let go of mine. And when I say “mine,” maybe that’s inaccurate since I found it in a Little Free Library. I’d heard about Signe’s trip in Faerie magazine and had been meaning to get this book, so I grabbed it, and am so glad I did. In any case, my household does give away a lot of books to Little Free Libraries, so maybe the faeries don’t mind if I ke I loved this book to the point where I am definitely going to give it to friends/family, but I will buy them their own copy because I don’t want to let go of mine. Signe’s voice was instantly easy for me to like and relate to. She sounds like, well, me, in terms of wanting more magic in the world, but being a skeptical modern city dweller at the same time and kind of doubting we’ll find any such thing. Still, the notion of faeries won’t leave her alone, so she sets off on a research and exploration trip to the British Isles (with one earlier odd experience in Mexico, which is worth mentioning since, as she notes, really ALL countries in the world have stories about beings that essentially match the description of faeries). She hits the perfect balance, for me, of being open to a bit of mystical exploration and being wryly self-deprecating for dedicating a long trip to something so odd. As anyone who’s looked beyond Disney knows, faeries in folk beliefs are usually not harmless little flowers with wings. Old written stories, and those who have studied the topic, tend to agree that faeries are more like nature entities whom we rarely see, who have their own methods and morals that can often go fully into the scary and creepy from the human point of view—much like the behavior of some animals (or, you know, some humans). Some, however, can be wonderfully helpful if we approach them with respect (again, like animals or our fellow humans). Or they can be anything in between. She interweaves memories of her father into the narrative, since she was getting over his recent death at the time of her travel. One thing she never brings up, but which certainly came to my mind and which she likely discovered in her reading too, was that in some theories, the faery realm is part of, or overlaps with, or simply is, also the realm where departed human souls go. (I’m pretty sure W.Y. Evans-Wentz talks about this, and she did read his book among her research.) I don’t know how I would view that theory myself if I were still in stages of grief for a loved one, so I can see why she didn’t try to explore it on the page. It also enters into too much conflict with religion for too many people (though whether it would for Signe and her family, I don’t know). Still, I personally found it a comforting unspoken thought that helped tie together those two narrative threads of faeries and the loss of her father: a common theme of things that are now gone and making us sad for their loss (like the ancient ruins that evoke sadness in her), but with the sweeter possibility that everything comes back together in a place we can’t quite see from here. Short version of review: if you are into the fae, or cool ancient-site-themed travel in the UK, you must read this! Now! I bought this book in a lovely bookshop The Speaking Tree in Glastonbury. If you ever been to Glastonbury, you know that this is a very special place. Just looking at shop's windows you will know that something is different there - the town is full with crystal shops, windows decorated with faeries wings, goddesses figurines. There is a Goddess Temple. It's a very spiritual place, and shops alone show this. Faery Tale is a perfect book to feel a little bit of this spirituality that is still prese I bought this book in a lovely bookshop The Speaking Tree in Glastonbury. If you ever been to Glastonbury, you know that this is a very special place. Just looking at shop's windows you will know that something is different there - the town is full with crystal shops, windows decorated with faeries wings, goddesses figurines. There is a Goddess Temple. It's a very spiritual place, and shops alone show this. Faery Tale is a perfect book to feel a little bit of this spirituality that is still present is few places in United Kingdom and Ireland. The author starts a journey with one goal - to find faeries. She goes to England, specifically to the very Glastonbury where I bought the book. She goes to The Isle of Man, Ireland and Scotland. She meets all the different people who still believe in faeries that help her to find her own faeries. It's fascinating book. I especially liked to read about the history and mythology behind the places she visits. She also includes account of her seeing and feeling of faeries, how they contacted her and how she felt their presence. Some of them were just a bit too much for my skeptic mind, but I tried to open my mind and do not judge. True story: I kept putting off finishing the book. Not because it was bad, but because I didn���t want it to end!! There are so many things to like about Pike���s work that it���s hard to know where to start. I think what I enjoyed best (besides the author���s easily-readable prose) is her self-awareness. She knows how strange it sounds that, in the 21st century, she is looking for evidence of tiny magical creatures. She approaches the situation with an adult-like practicality and an open mind a True story: I kept putting off finishing the book. Not because it was bad, but because I didn���t want it to end!! There are so many things to like about Pike���s work that it���s hard to know where to start. I think what I enjoyed best (besides the author���s easily-readable prose) is her self-awareness. 1. Don't say your book is about a topic when it's really about you. 2. Don't write a memoir unless you have a unique experience to write about. I zipped through this memoir/travelogue of a young woman's search for faeries, which was fun and engaging. I wish I could have had a book contract to travel to Glastonbury, the Isle of Man, Ireland and Scotland in search of magic and enchantment - why didn't I think of that? The author tried to tread somewhere in the middle between a rationalist's look at world folklore (though giving only the briefest examination of a very extensive subject) and the psychic/intuitive exploration of a metaphysic I zipped through this memoir/travelogue of a young woman's search for faeries, which was fun and engaging. I wish I could have had a book contract to travel to Glastonbury, the Isle of Man, Ireland and Scotland in search of magic and enchantment - why didn't I think of that? The author tried to tread somewhere in the middle between a rationalist's look at world folklore (though giving only the briefest examination of a very extensive subject) and the psychic/intuitive exploration of a metaphysical phenomenon, as well as mixing in her own lingering grief over the loss of her father. In her quest to re-kindle the magic and belief of childhood, she became more child-like, choosing to not always look through the filter of a concrete rational adult who lived and worked in Manhattan. But secrets do not always reveal themselves just because someone decides to believe. While not possessed of strong psychic gifts like her friend and part-time travel companion Raven, she was willing to open herself up to new experiences that were definitely in the woo-woo category. That takes some bravery and trust, or naivete and gullibility a cynic might say. And she had, well, interesting experiences. Yes, much of it could be said to be her imagination from a receptive state, but why was a black feather always being put in her path? In her new openness she learned to see things differently and listen to her intuition, and found that to heal ourselves and the planet, maybe it's the faeries who can show the way. This was a memoir/travelogue that I didn't want to end - I wish I was still reading it! You don't have to believe in faeries to be drawn into the spell of Signe Pike's frolicking memoir. Stifled by the concrete jungle of Manhattan, Pike embarks on a journey to England, Ireland, the Isle of Man (in the middle of the Irish Sea) and Scotland, in search of magical faery realms. With equal parts skepticism and childlike wonder, Pike welcomes the unknown and allows her "faery journalism" to guide her t This was a memoir/travelogue that I didn't want to end - I wish I was still reading it! You don't have to believe in faeries to be drawn into the spell of Signe Pike's frolicking memoir. Stifled by the concrete jungle of Manhattan, Pike embarks on a journey to England, Ireland, the Isle of Man (in the middle of the Irish Sea) and Scotland, in search of magical faery realms. With equal parts skepticism and childlike wonder, Pike welcomes the unknown and allows her "faery journalism" to guide her to the people and places radiating enchantment. Her warmth, curiosity and sense of humor make for the perfect travel companion. Moments of levity (calling on the faeries to guide her through her first British roundabout) are balanced by faith and trust (when a four-year-old's innocence and instinct help to reveal an ancient faery bridge.) And as much as Faery Tale is a whimsical adventure, it's also an emotional journey as Pike shares the challenge of coping with her father's death and reconciling the complicated figure he was in her life. Only by examining the forgotten world of faeries can Pike reclaim what she'd lost: a deep connection with herself, the earth and every living thing around her. Her travels offer a perfect antidote for our collective "emotional deforestation" - the loss of magic and innocence - that had been gnawing at her. "My biggest fear is that if we continue to stifle this loss, half the people on the planet will forget what their forest even looked like in the first place," she writes. There seems to be a genre now of women given a book advance on the premise of traveling abroad for the purpose of self discovery. I'm not convinced that this is necessarily the best way to fund a book. This book seemed a bit unpolished. I'm still not sure the author is even convinced of her thesis. Originally Read from May 17 to 27, 2014. Re-reading Jan 2016-May 2016. If you read one book this year make it this one! Truly life changing, even for those of us who believe in magic! Very inspirational! You must be willing to suspend disbelief completely in order to really enjoy this book, because it's not particularly well-researched or well-organized, but if you can just go with the flow, it is an enchanting journey to follow. A really interesting read, makes the concept of faeries more than what you read in children's books. They become something connected with the natural world, they begin to seem plausible if you open your mind. The writing was not always my style, but a really interesting journey. This enchanting memoir is sort of Eat Pray Love for faery lovers. Signe Pike is a young woman who quit her job as a book editor for a New York publisher and went on a quest to find out if faeries are real. I was maddened, delighted and inspired many times over during my reading of this truly modern faery tale. Because that is what it is, a faery tale in the voice of a modern young woman who wanted to believe in magic, in things that cannot be seen and in happy endings. Signe Pike is young enough to be my daughter (or maybe it's that I am old enough to be her mother.) She is almost young enough to be my granddaughter (actually I have no idea how old she is, I'm just guessing.) Anyway, it was inevitable that she would make me mad sometimes. I started the book and by about page 30, I threw it down and thought I would not waste my time for another page. The voice of Signe Pike struck me as silly; an amalgam of the tone of Facebook comments, texting between teens and People magazine. I now realize that I was suffering from generation gap. That evening I spent hours with my youngest friend, a 25-year-old aspiring writer. We drank wine, told each other stories, talked about life and read our latest efforts to each other. I love this woman because she reminds me of my younger self and hanging out with her is effortless. Somehow that evening led me to pick up Faery Tale again the next morning and I read it all day until I got to the end. I still got mad a few times but mostly I was delighted. I've done my own faery research over the years. I too believed in faeries as a child. I have encountered disembodied beings on an island in Lake Michigan, on Mt Tamalpias, in Ireland, in the Redwoods and in my own backyard. About ten years ago I spent a few months reading up on how to contact faeries and I have always read magical stories, from C S Lewis and E Nesbit as a child to Suzanne Clarke and John Crowley in recent years. As I kept reading Signe Pike, I saw that she was trying as hard as she could to remain objective and not get sucked in to a bunch of airy-fairy, New Age ridiculousness. She was on a quest to find some meaning for her life and to make sense of her relationship with her father who had passed away. She was also looking for hope in a world that seemed to be heading for disaster. I am so down with all of that. As she traveled to Glastonbury (where I have always wanted to go), to Ireland (where I have been), to the Isles of Man and Skye, to Scotland and Findhorn, I began to feel I was in pretty good hands. Her process of slowing down, learning to let things happen, listening more closely to her intuition and bonding with the various faery "experts" she interviewed, made me happy for her. The whimsical title and lovely book jacket caught my eye, but it was the dedication and poem at the beginning for the author's loss of her father that led me to purchase this book. I found myself thinking “suspend disbelief” when I started it, and had to smile when the author echoed those exact words toward the end of the book. My freshman year in college, I had to write a debate essay. I chose to argue that it was not possible to disprove that magical creatures exist. How can you emphatically state a unicorn does not exist because you can’t see it – you can’t see air, you can’t see energy, you can’t see love, you can’t see God. At a catholic college bent on intellectual discourse, it was a controversial stance to take – which was largely why I took it – it was a debate, after all. I liked the idea of this book more than the book itself, though it was a quick, enjoyable read. The fact that faeries don't automagically (ha) turn up when sought pleased both my inner skeptic and the little girl who had to keep other books on top of Froud and Lee's Faeries lest Jenny Greenteeth and Peg Powler emerge from their swampy pages hoping to drag me back in with them. There are a number of lovely anecdotes, particularly in the Isle of Man section, but Pike's writing is a mixed bag, with I liked the idea of this book more than the book itself, though it was a quick, enjoyable read. The fact that faeries don't automagically (ha) turn up when sought pleased both my inner skeptic and the little girl who had to keep other books on top of Froud and Lee's Faeries lest Jenny Greenteeth and Peg Powler emerge from their swampy pages hoping to drag me back in with them. There are a number of lovely anecdotes, particularly in the Isle of Man section, but Pike's writing is a mixed bag, with some odd word choices that distracted from the narrative — surprising given her background as an editor — and the research she undertook comes across as pretty minimal. I try not to frown upon books when they don't match my preconceptions but, man, more extensive accounts of local history, folklore and mythology would have been so welcome. If you like Elizabeth Gilbert's 'Eat, Pray, Love' and you're open-minded to the mystical possibility of the fae, you'll like this book. Pike's writing style is engaging as you travel with her on a journey to "see" beyond the faery veil and incorporate magic in everyday life. The book chronicles her experiences as she travels to different parts of the world to learn more about the stories involving magical creatures. Well-known places that she visits include Glastonbury and the Isle of Man, where If you like Elizabeth Gilbert's 'Eat, Pray, Love' and you're open-minded to the mystical possibility of the fae, you'll like this book. Pike's writing style is engaging as you travel with her on a journey to "see" beyond the faery veil and incorporate magic in everyday life. The book chronicles her experiences as she travels to different parts of the world to learn more about the stories involving magical creatures. Well-known places that she visits include Glastonbury and the Isle of Man, where she meets people from all walks of life spanning the countries of Mexico, Scotland, Ireland, and England. You also get to see how her search affects her home life in New York City. Pike receives support from her friend Raven (a reiki practioner & pagan priestess) and her fiancé, Eric. She also confronts memories of her late father throughout the book, which seem out of place at times, but you really get to see her personal development through these flashbacks. This is the author's first book and I look forward to more! I enjoyed this book very much and in a way find it a brave thing for someone to not only pursue and risk such a journey, but also to write a book that most probably will be loved by many readers, but also really disliked by others. Faeries are always a theme that can get you ridiculed by people. So... go Signe Pike for taking this journey! A journey like this most likely calls for you to set your intuition free and to let go of the natural scepticism we're used to (nothing wrong with that, a heal I enjoyed this book very much and in a way find it a brave thing for someone to not only pursue and risk such a journey, but also to write a book that most probably will be loved by many readers, but also really disliked by others. Faeries are always a theme that can get you ridiculed by people. A journey like this most likely calls for you to set your intuition free and to let go of the natural scepticism we're used to (nothing wrong with that, a healthy kind of awareness is a good thing, but when it rules your every thought... that's a pity). Also to be ready to believe and trust, and it will most likely have you travel into your own soul as well. I liked that this is written on a personal level - anything detached wouldn't have worked for me, not with this subject. I really enjoyed reading this book a lot. The best part was easily the Isle of Man, but it's overall a fun read. I've been to a few of the place she mentions, and now I want to go to all of them. There are some parts that don't deserve the four stars, but the bulk of the book IS about faeries and Signe Pike's strange experiences with their sites in the British Isles. She had some neat experiences and talked to interesting people, and her research is good. What I didn't like was when she started I really enjoyed reading this book a lot. The best part was easily the Isle of Man, but it's overall a fun read. I've been to a few of the place she mentions, and now I want to go to all of them. There are some parts that don't deserve the four stars, but the bulk of the book IS about faeries and Signe Pike's strange experiences with their sites in the British Isles. She had some neat experiences and talked to interesting people, and her research is good. What I didn't like was when she started trying to legitimize her project (this is how it came off) with snippets about her father's death and coming to terms with who he was. It didn't ring authentic to me like the rest of the book - it felt forced, and the writing deteriorated in those bits. I skipped them and enjoyed the read more for it. This review has been hidden because it contains spoilers. To view it, click here. Well, it boils down to...Pike believes in the existence, corporeal and otherwise, of fairies and related "magical" beings (e.g., house gnomes). How you feel about this will affect how you feel about the book in general. I have picked up this book and put it back on the shelf for months because my own cynicism and "oh, come ON" kept warring with my own love of things mystical and tied to ancient (and I mean, REALLY ancient) England/the Celts, and my own yearning to see signs and portents everywhe Well, it boils down to...Pike believes in the existence, corporeal and otherwise, of fairies and related "magical" beings (e.g., house gnomes). How you feel about this will affect how you feel about the book in general. I have picked up this book and put it back on the shelf for months because my own cynicism and "oh, come ON" kept warring with my own love of things mystical and tied to ancient (and I mean, REALLY ancient) England/the Celts, and my own yearning to see signs and portents everywhere instead of having to make decisions based on prosaic things like, uh, practicalities, etc. So...yah. Measure your own cynicism and proceed accordingly. Do you believe in Fairies? Signe Pike does. 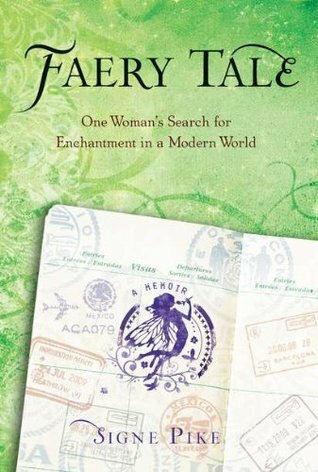 Faery Tale is a memoir and travel book recounting Signe’s travels through Britain and Ireland looking for the magic which is everywhere in childhood but which in our modern era we as adults dismiss so easily. 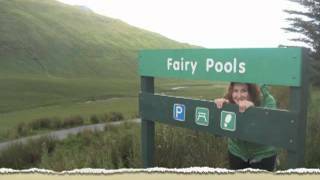 Signe examines the mythology and traditions of England, The Isle of Man, Ireland and Scotland and the stories which were fireside favourites not so long ago and she travels to the places associated in folklore with Fairies such as Glastonbury, Dun Do you believe in Fairies? Signe Pike does. Faery Tale is a memoir and travel book recounting Signe’s travels through Britain and Ireland looking for the magic which is everywhere in childhood but which in our modern era we as adults dismiss so easily. Signe examines the mythology and traditions of England, The Isle of Man, Ireland and Scotland and the stories which were fireside favourites not so long ago and she travels to the places associated in folklore with Fairies such as Glastonbury, Dun Aengus, Snaefell, The Fairy Bridge and many others. With a similar feel to the bestselling Eat, Pray Love this book focuses on both the inward and the physical journey. This is a beautiful book highlighting our need to reconnect with nature and the past. If you’re interested in folklore this is a must read. I loved this book. Signe Pike is a really talented writer and her search for fairies and enchantment had me hooked from the beginning. After the loss of her father, Signe Pike travels to different parts of the world to search for enchantment in a modern world. Signe travels to parts of Mexico, England, Ireland, Scotland and Man of Isle. As she discovers the world of faeries and other enchanted creatures, Signe is able to bring closure of her father's death. This could be classified as a travel or personal memoir. The reader is able to read about beautiful descriptions on Signe's travels. Readers are also able to see Signe grow a After the loss of her father, Signe Pike travels to different parts of the world to search for enchantment in a modern world. Signe travels to parts of Mexico, England, Ireland, Scotland and Man of Isle. As she discovers the world of faeries and other enchanted creatures, Signe is able to bring closure of her father's death. This could be classified as a travel or personal memoir. The reader is able to read about beautiful descriptions on Signe's travels. Readers are also able to see Signe grow as a person as well. Signe Pike is the author of LOST QUEEN Trilogy (Touchstone/Atria/S&S). THE LOST QUEEN was a Barnes & Noble "Discover New Writers Pick" & a Kirkus Reviews Best Book of 2018. Her memoir FAERY TALE: One Woman's Search for Enchantment in a Modern World, was a "Best of 2010" Pick from Kirkus Reviews and received glowing reviews from Harper's Bazaar, Women's Adventure Magazine, and renowned Signe Pike is the author of LOST QUEEN Trilogy (Touchstone/Atria/S&S). THE LOST QUEEN was a Barnes & Noble "Discover New Writers Pick" & a Kirkus Reviews Best Book of 2018.